At EBS we know that payroll is a critical part of your business and that your time is better spent focusing on the success and growth of your company. The payroll process is complex and getting it wrong can lead to penalties, unhappy employees and costly long-term resolution issues. That’s why companies like yours opt to outsource payroll to experts like us. 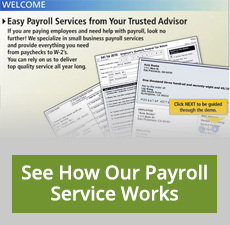 Essential Business Services understands the importance of utilizing a reliable payroll service for your business. Convenient – Run payroll online anytime from anywhere. Cost Effective – Online processing costs less than the more traditional services and we pass the savings onto you. Compliant – Payroll tax deposits and tax returns are filed electronically with an on-time guarantee. Payroll processing, combined with our bookkeeping and tax services, provides solid professional support for your business. Are you ready to save time and money and focus on growing your business? Get started now. Call EBS at (703) 754-2601 or request a consultation.